The Detroit tungsten carbide wedding band is guaranteed to draw attention. 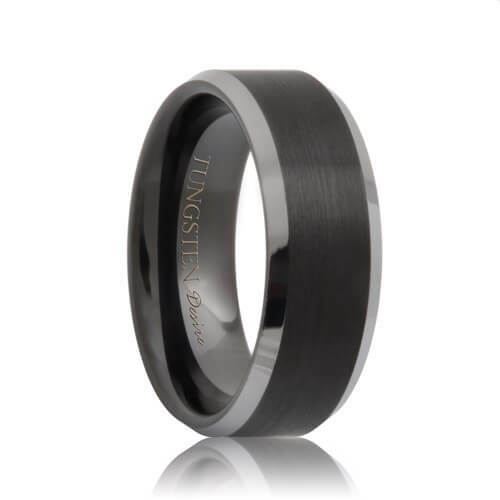 The most extraordinary black tungsten wedding bands are created when you add a brushed finish to them. The beveled and highly polished edges give this ring a unique look. The allure of the different colors complementing each other produces a new style rising in popularity. 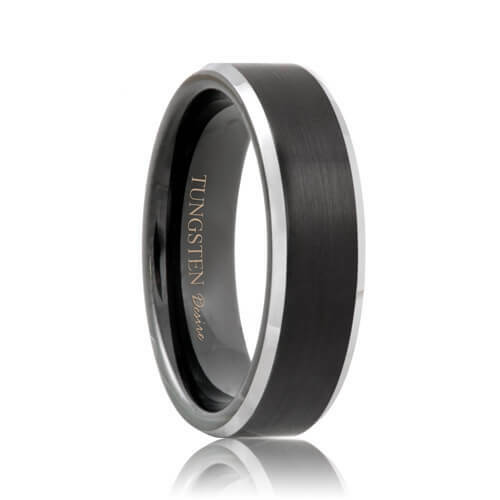 Black tungsten rings are guaranteed never to fade or tarnish. Ships within 1 business day. Free Lifetime Warranty and Lifetime Sizing; pay no restocking fees or deductibles! This site is so educational to everyone who doesn't know anything about tungsten jewelry. It was so easy to choose the style I wanted without the pushy salesman. When I decided on the style of the ring, black tungsten band, I got the flat with bevels to look different. I was delighted!!! I've already referred Tungsten Rings & Co. to over a dozen family and friends! I wish all things in life was this easy. Thanks.